Château Simone, as the name might suggest, is not located in Bordeaux, but situated in a tiny, historic appellation called Palette. Palette is just south of the town Aix-en-Provence, amidst pine forests, the Arc River, and Mont Saint-Victoire (whose beauty Cezanne loved to capture). at the helm of the grounds, is a grand old piece of architecture, and looks like something out of a Hans Christian Andersen fairytale. 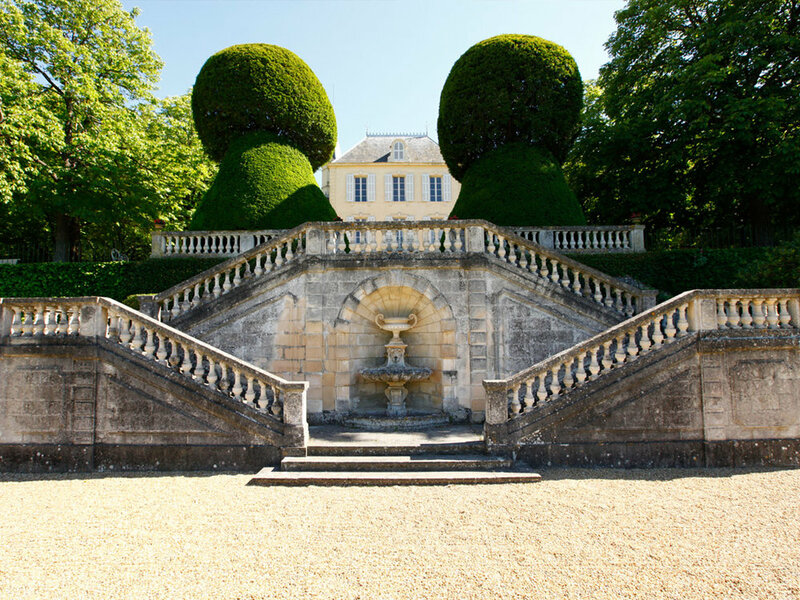 Staircases, shrubbery and ponds frame the iconic estate, and give you a little taste of what to expect in these wines. Winemaking has taken place in Palette since the Roman times (much like the rest of France), and the Rougier family has been in control of Château Simone for almost two centuries. Simone has an almost monopoly of the AOC of Palette, and the wines truly showcases the Provencal terroir. Château Simone has 20 hectares of land under vine (approx. 50 acres) on limestone soils, 500-750 feet above sea level. The grapes grown on the property are a melange of Rhone and Mediterranean varietals. The white grapes include: Clairette, Grenache Blanc, Ugni Blanc, Bourboulenc, Muscat Blanc, Picpoul, Furmint and Sémillon. The red grapes are: Grenache, Mourvèdre, Cinsault, Syrah, Carignan, Cabernet Sauvignon, Castet, Manosquin, Théoulier, Tibouren, Picpoul Noir and Muscat de Hambourg. Clairette is the primary grape in the waxy whites; Grenache & Mourvedre work in tandem for the stoic reds and spicy roses. are very hard to come by, and the French typically like to keep these gems for themselves - though they can be spotted at top wine lists in New York & San Francisco. Neal Rosenthal has been working with the Rougiers since 1981, and also speaks to the quality of the wine. The Château Simone Rosé is made with the idea that challenges the idea that rosés are meant to be drunk young, and preferably in the current vintage. It has a beautiful faded grey and pink color; only 1500 bottles come to the US market. A true age worthy Rosé. 2400 bottles of the white and red make their way across the Atlantic. The Clairette in the white picks up the pine resin from the neighboring forests, and highlights intense minerality from its cast of friends. The wine is quite bright in its youth, but can age 20+ years, becoming even more complex and mystifying in the bottle as it lays down. The red is the epitome of elegance and layers upon layers of flavor, fruit, earth & terroir literally leap out of the glass. Because of its provencal landscape - and the history of stellar cuisine from this area - you could imagine the foods that would be an ideal pairing. Lamb with fennel, rosemary & lavender; also exceptional with a simple local Ratatouille. The white and rosé are wonderful with treasures plucked from the Mediterranean: classic Bouillabaisse with garlic rouille, Loup de Mer with olive oil and fresh herbs, or maybe just a bowl of olives. If you’d like to learn more about these wines, please reach out. We are here to help (and share a bottle or two).
. . . . . . . . . . . . . $68 btl : only offered in set of all three wines due to the rarity of the wine.
. . . . . . . . . . . . . $200 Rare set of all three wines. Regular Price $218 : One bottle of each of Rosé, White & Red. Someone from the Hart & Cru team will be in touch shortly to confirm your order.